Have you ever wondered what you would say if someone asked you what you believed as a member of the Church? The scriptures tell us about the beliefs of The Church of Jesus Christ of Latter-day Saints. The Articles of Faith are part of the scriptures. They are found in the Pearl of Great Price. President Thomas S. Monson told a story about a man from the eastern United States who was traveling by bus to California. In Salt Lake City a Primary girl got on the bus and sat next to the man. They started talking, and he asked if she was a Mormon. She answered yes. He asked her what Mormons believe. It was a big question for such a young girl. What would you have said? Imagine the look on the man’s face as she recited and explained the Articles of Faith. He couldn’t believe it! After she got off the bus, the man thought about her courage and knowledge. As soon as he arrived in California, he called the local mission president and asked questions about the Church. The missionaries came to see him, and later the man’s entire family was baptized﻿—all because a Primary girl knew the Articles of Faith and had the courage to share them (see Ensign, April 1994, pages 67–68). Where did the Articles of Faith come from? In March 1842 the Prophet Joseph Smith received a letter from Mr. Wentworth, a newspaper publisher in Chicago, Illinois, asking questions about the Church. As Joseph answered the letter, he was inspired to write 13 statements that contain many of the beliefs of the Church. These statements became our Articles of Faith. Later, in 1880, members at the October general conference of the Church voted to accept the Articles of Faith as scripture. Punch two holes in the top or side of three pieces of paper; then thread yarn or string through them to make a book. 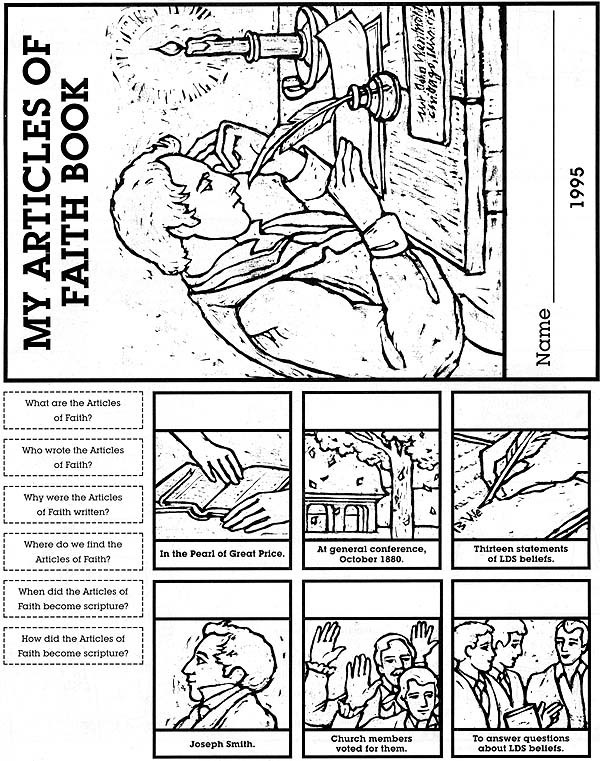 Color the picture of Joseph Smith writing the Articles of Faith and fill in your name at the bottom. Cut out the picture and glue it on the first page of your book. On the second page, write the heading “The Articles of Faith.” As you learn about them now and during the rest of the year, you can copy them on this page. Color the pictures on the bottom of page 13. Cut out the pictures and the questions. Glue each question above the picture that answers it, then glue the picture on the third page of your book. During the year, you will add words and pictures to your book. Make a mural that shows how the Articles of Faith came to be. Divide a long roll of large paper into six sections. In each section, write one of the following questions: What are the Articles of Faith? Who wrote the Articles of Faith? Why were the Articles of Faith written? Where do we find the Articles of Faith? When did the Articles of Faith become scripture? How did the Articles of Faith become scripture? Using the activity on page 13 as a guide, divide the children into six groups and have each group draw the answer to one of the questions and explain it to the other groups. It is suggested that each group have a mixture of ages for learning and variety. Invite the missionaries to testify about the Articles of Faith. If they have missionary cards with the Articles of Faith on them, ask them to share an experience they had when they used their cards.